&ast; Main drive of the machine and conveyor are equipped with A/C Motor having synchronized variable A/C frequency drive. &ast; Containers moving on the SS Slat Conveyor belt are fed by filling nozzles through a settable twin pneumatically operated stopper system. &ast; The twin pneumatically operated stopper system and reciprocating nozzles precisely match the centre of the nozzles below to avoid the spillage of liquid on the conveyor belt. 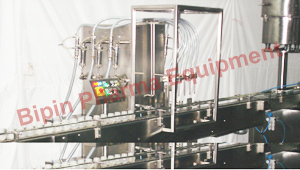 &ast; To minimize the foaming, adjustable nozzles reciprocate according to the dosage of filling. The nozzles go up slowly from the bottom level of the bottle towards the neck during its filling takes place. &ast; The dosing block with a hexagonal bolt fitted below the syringes allows easy setting of the fill size. Number of head/syringe 4 Nos. 6 Nos. 8 Nos. Flat / Square 1.5 HP / 415 Volts / 50 Hz. Net Weight 600 kgs. 700 kgs. 850 kgs. Gross Dimensions 850 kgs. 950 kgs. 1100 kgs.